The new serials which have just begun or are coming up on some of the Indian channels are based on a variety of different themes as opposed to the usual saas bahu drama. I am glad that Indian television is growing by leaps and bounds. It is trying to cater for all ages. Though some of my favourites are family based like Diya aur Baati Hum, Balika Vadhu, Yeh Hai Mohabbatein. Yeh Rishta kya kehlata hai, I am enjoying the new ones like Everest, Nisha aur uski cousins and Udaan. Kailesh Satyarthi a child’s right activist and Malala Yousafzai an education activist have won the Peace Noble Prize. While their cause has become more apparent and in the limelight of the whole world after winning the prize, serials like Balika Vadu and Udaan are trying to address these issues. Change can only come if we learn something from the serials we watch. Each one has a strong message – family unity, child labour, girls education, meeting your goals, career issues etc. I have no qualms in admitting that I love watching some of the Indian serials. Its a constant reminder of family values, a link to our culture and entertainment. A couple of weeks ago I was entertaining family and their request was to make some cooling dishes and nothing too hot and spicy. So obviously chaats was on the top of my list. I served dahi papdi chaat in individual portions as opposed to serving them on a plate in the traditional way. I left extra papdis on the side so that the guests could take some more as they went through their individual portions. I love dahi papdi chaat, in fact any type of chaat. While taking the photo, I forgot to add the sev ! Do you like watching Indian serials? Add salt and ajmo to it. Add water and form a dough which is not too soft and not too stiff. Cover the dough with cling film or tea towel and let it rest for 30 minutes. Divide the dough into 3-4 parts. Roll into a thin circle. Using a cookie cutter cut the rolled chappati into smaller circles. I used a 2½” cutter. Keep the small circles on the side. Repeat steps 7 to 9 using rest of the dough. Also keep on adding the remaining dough which is left after cutting out the smaller circles. Heat oil in a wok, karai or deep pan over medium heat. In the meantime cut small slits in each of the small circles. When the oil is ready, reduce the heat to low setting and fry the discs 6-8 at a time. Fry till they are crispy. Keep the papdi on the side till they cool down. Store in an airtight container till required. Lightly beat the yogurt with a spoon. Add salt, sugar, red chilli powder and cumin powder to the yogurt and mix well. Drop a papdi in each individual container. Add to it about a tbsp of boiled chana, moong, chopped onion and potatoes. Top it with about 3 tbsp yogurt. Add dadam, sev and chopped coriander. Place a papdi or two on top and serve. Place 5-6 papdis on a plate. Top it with chana, moong, potatoes. Add the chutneys, sev and dadam. Garnish with chopped coriander and onions. Usually ½ cup of chana (chickpeas) soaked overnight and boiled in salted water gives 1 cup of chana. You can add chaat masala to the yogurt or sprinkle it on top. You can use ready made papdis. You can make papdis using only plain flour. Thin sev is readily available in all Indian stores and sweet shops. The above measurements for the chaat are what I required. It depends on individuals on how much of the chutneys, yogurt and other ingredients are needed. Am craze of this chat at my college days!! Back to memories!!! Love it dear!!! Am not a good tele lover dear..
Nice dahi papdi chat, Nice to know you are in Mombasa,I lived in Kisumu, Kenya for 5 years and had many gujrati friends. This is nice idea to serve individual portion. 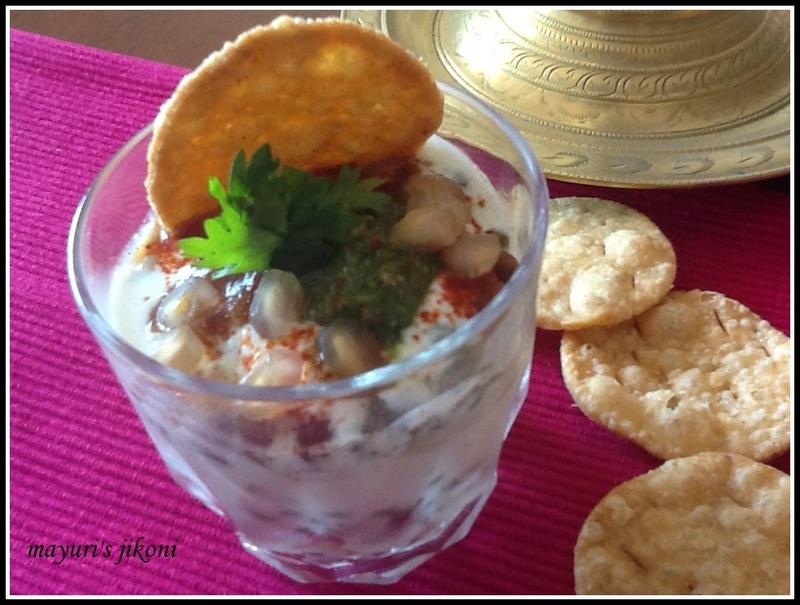 Dahi papdi chaat looks really delicious..
DAHI PAPDI CHAAT sounds so yummy…will surely try it. Thnx.